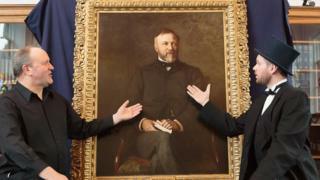 The great-great-great-grandson of Andrew Carnegie is to play the Scottish philanthropist when a musical about his life is staged in Dunfermline. Joe Whiteman, is descended from the Dunfermline-born business man on his mother's side. The 28 year-old music teacher will reprise the role in Carnegie - The Star Spangled Scotchman, after playing the part at the Edinburgh Fringe in 2016. The show will have a two-night run at Carnegie Theatre from 17 May next year. Carnegie, who died in Massachusetts in 1919, is said to have given almost 90% of his fortune to charities, foundations, and universities - about £273m ($350m). The musical tells the story of his life from the perspective of a steelworker killed in the controversial homestead steel plant dispute of 1892. He has returned from the afterlife to decide on Carnegie's eternal fate in the last two hours of his life. The show was developed by Ian Hammond Brown, who won a development grant from Creative Scotland in 2013. He said: "It's a great opportunity to work with a fantastic cast again, a number of whom appeared in the Fringe production, as well as support the local community. "It's always been my dream to perform the show at the Carnegie Hall and it's particularly poignant in 2019 as it's the centenary year. Many thanks to Fife Cultural Trust for its support." Fife Cultural Trust donated the hire of the theatre free of charge in tribute to the legacy of Carnegie.